INDUSTRY.co.id - Jakarta - In the world of photography, portrait mode is one of the functions of digital camera used when photographing a single subject. When taking a photo in portrait mode, the camera will automatically use a large aperture to help keep the background out of focus with a narrow depth-of-field so that it only focuses on the object, and displays the bokeh effect behind the object. Portrait mode is also one of the advanced features available on the Vivo V7, the latest V-Series from Vivo Smartphone. With the portrait mode, users can take pictures that look professional, focused, and sharp. Interestingly, this feature of photography can already be enabled on both cameras, both front and rear, though not using dual cameras, as Vivo once present on V5Plus. "The portrait mode feature of the smartphone is one of the preferred features of photography, with portrait mode not only on the front camera, but also the rear, the Vivo V7 produces images with natural Bokeh effects, PDAF technology on the rear camera, and large aperture on the front camera, making Vivo V7 reliable for various mobile photography needs, with results such as using DSLR cameras "said Irvan Alfianto, Product Manager of PT Vivo Mobile Indonesia, Wednesday (22/11/2017). Capturing selfies with depth-of-field focus settings does make the photos look more interesting. Vivo V7 with 24MP camera resolution produces images that are sharp enough to later segmented by providing a Bokeh effect on the background. In addition, the enhanced algorithm keeps the focus on the fixed face of detail and the smooth Bokeh effect. Make sure FunTouch OS Vivo V7 has been updated to Version 1.8.6, open the camera application then activate the portrait mode option at the top of the screen, adjust autofocus to adjust the lighting, focus the object, and see blue results in the background. Capture your perfect moment with the 24MP Vivo V7 front camera. Maximize the image with additional editing features on Vivo V7, such asFace Beauty, crop, and photo effects. Rear camera on a smartphone is usually used for mobile photography more diverse. 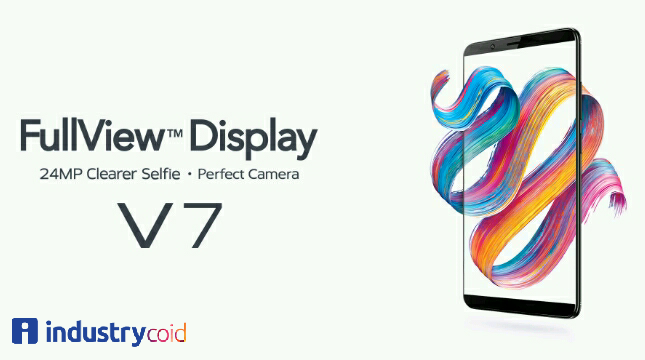 Vivo V7 equipped with 16MP rear camera, as well as various other features such as: professional mode, PPT mode, and the latest, portrait mode. When you want to activate portrait mode on Vivo V7, it steps that need to be done almost the same as on the front camera. To produce images with a Bokeh effect on the background, Vivo V7 relies on PDAF technology that automatically adjusts the focus and depth of the image. In addition, the algorithm on the Vivo V7 rear camera that separates the main object of the image with the background, so that the images with portrait modemenggunakan rear camera more qualified. For maximum rear-view camera portrait, make sure the image object size is not too small and note the distance of the smartphone when it is close enough and provide a place for the background. Position Vivo V7 in a fairly close distance to the object. If taking a selfie, it would be better if all parts of the head and shoulder areas are caught in the picture frame. When using the Vivo V7 rear camera, the camera and object's ideal distance is 2 meters. For a photo together / group photo, make sure the grip position is within the same distance as the camera. Keep harmful accessories, such as sunglasses, scarves, or hats. Be sure to focus before taking a picture. Set focus targets several times before taking a picture until you feel the object is completely caught. Note the illumination of the image results still display the object and background clearly. Adjust the distance between objects against the background. The deeper the distance between objects with the background, the better it will be to produce the Bokeh effect. Larger screens help users improve image composition while using the camera, and view the image results more freely. Vivo V7 with a minimal design bezel FullView Display 5.7 Inch has a screen-to-body ratio of 83.6%. Much more spacious, without making a smartphone to be wasteful in size, Vivo V7 is suitable for smartphone users who are looking for devices with compact size when the activity, including when hunting photos.